Anne of Green Gables and Little Women have been my dear friends for many years. I even wrote my university thesis on them! So it is surprising that I have lived this long without getting acquainted with Laura Ingalls and her family from the Little House series. We’ve only met them last year. 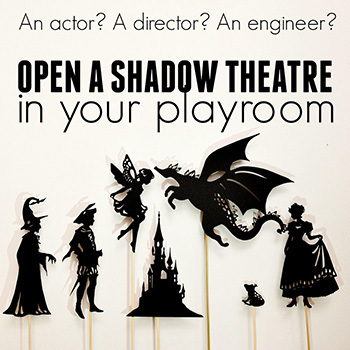 We were looking for something family-friendly to watch – you know, with a little guy always curious to have a peek at moving figures on the screen. After reading the synopsis of the TV series, we decided to give it a go. A story of a family that moves west and starts life anew, told from a young girl’s perspective, sounded promising, and of course, I knew that the Little House books were classics. As you can tell from my first sentence, I’m a fan of old-fashioned stories for girls, so it sounded like my sort of thing. 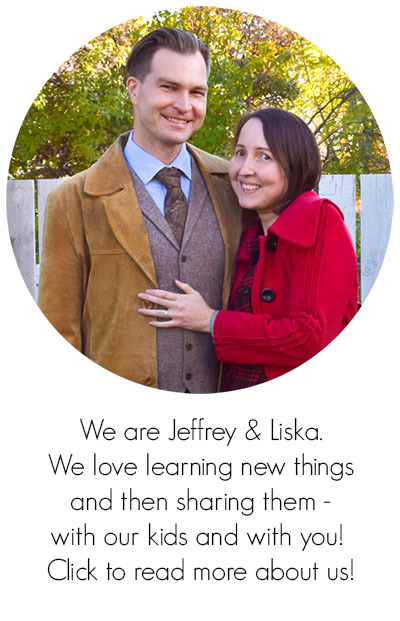 At the same time, my prairie-raised husband has always had an interest in the pioneers, so it seemed like he would enjoy Little House on the Prairie too. We found an old DVD. But – oh no! – there were no subtitles. English is my second language. I can write and speak freely, and I don’t have difficulties understanding people when they talk to me. Yet I still feel a language barrier when I watch movies without subtitles. Go figure! I struggled through the first – pilot – episode of Little House on the Prairie. It was torturous – I got involved in the story, and I wanted to know what was going to happen next, but I felt like I couldn’t do it justice without subtitles. We had to put the idea aside. Closer to Christmas, I was thinking what would be a nice gift for me. I wanted something to make our holiday days cozy. “Wouldn’t it be nice to have some long pleasant movie that we could enjoy together as a family?” That’s when I decided to look into Little House on the Prairie again. That time I got lucky: I found out that a newer set of DVDs had subtitles! And that’s what I got for Christmas. So our Christmas days were filled with the nineteenth century prairies, kind neighbours and little girls in bonnets, running through the fields. Then the first season ended, and for St. Valentine’s day my husband bought me a second set of DVDs. I couldn’t help but tease him a bit, “Oh yes! I couldn’t wait to spend the evening with Charles Ingalls!” But neither could he! In the meantime, after watching about Laura and her family’s adventures, I felt the need to dedicate a bit of my creative time to them and make a little pioneer craft for my son. While he is too little to understand all the details of the show, he is always happy to point out all the children playing. 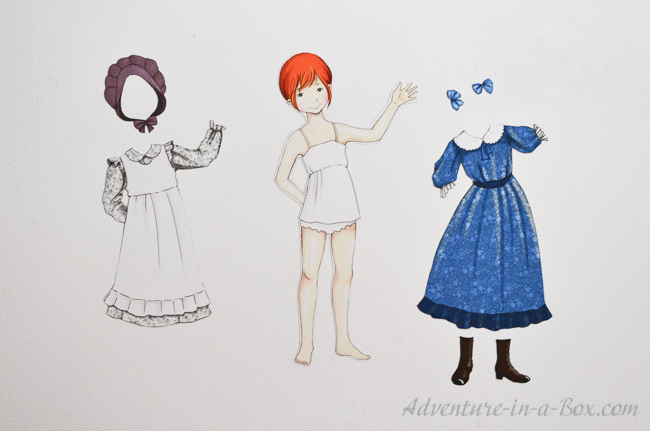 So I made him a little printable pioneer dress-up doll. 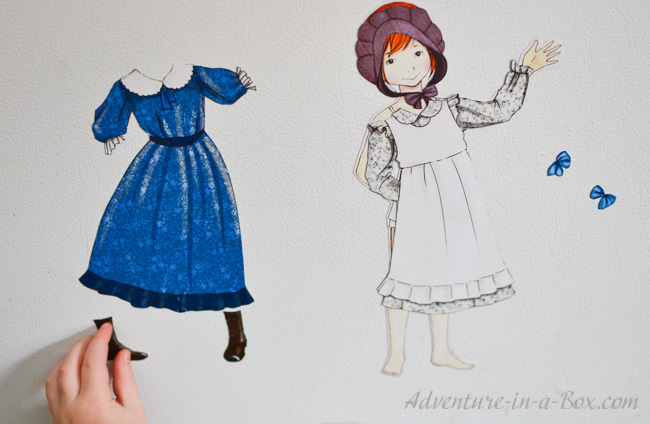 Our pioneer dress-up doll has three historical outfits: a play-dress with a pinafore and a bonnet, a Sunday dress and a nightgown with a night cap. Oh, and a pair of button-up leather shoes! I already had a pretty good idea of how girls dressed in that era, based on the show, but it was very interesting to do a little research. Little girls could wear dresses up to their calves, but starting at fourteen, girls needed to lower their dresses down to their ankles. Their shoes were very stylish! I sure wouldn’t mind having a pair of pioneer leather shoes myself. But I’m not sure how I’d feel about a nightcap – they wore them to keep warm. 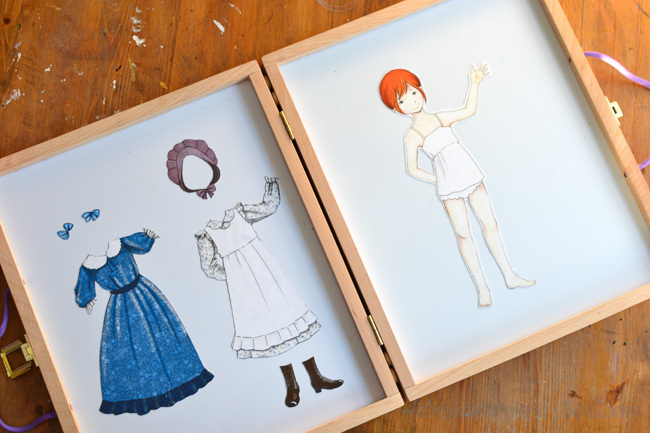 I love the social and cultural details that can be learned through historical fashion, and I imagine that can be an interesting introduction to history for a few kids, especially girls. My son was very interested in dressing up his doll as well. Historical context may be escaping him at this point, but it’s a logical puzzle for him, as well as a fine motor practice. 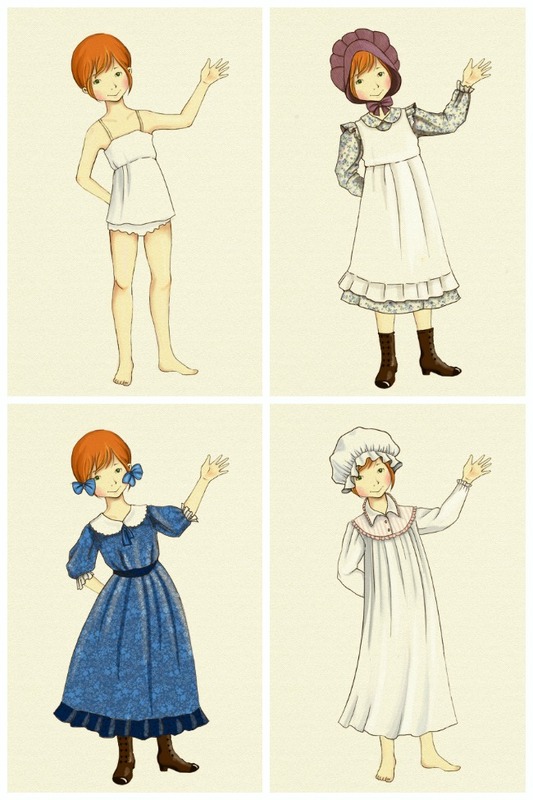 If you want to have a little pioneer girl living in your house, you can download my designs here. 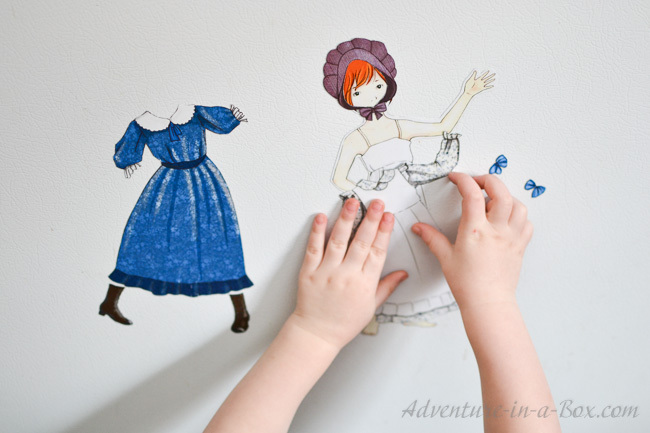 Print them directly on magnet sheets , or use thick paper with strips of magnet tape glued to the back. Cut the figure and the dresses out. Stick them to the fridge, and let the fashion show begin! 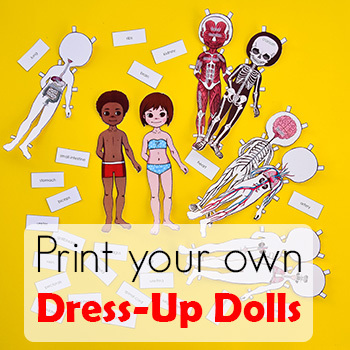 If you prefer the old-fashioned paper dolls, it would be easy to add a couple of fold-around tags here and there and play with them that way! 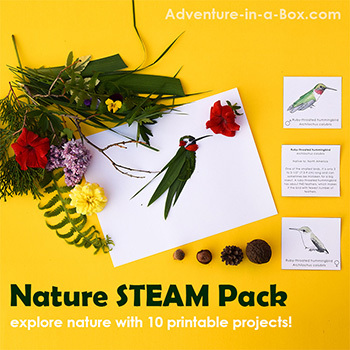 If you want to stay updated on new stories from Adventure in a Box, consider visiting our Facebook, Pinterest, Twitter or Instagram pages. Thank you for reading! My daughter is going to LOVE this! She is a huge Anne and Little House Fan.